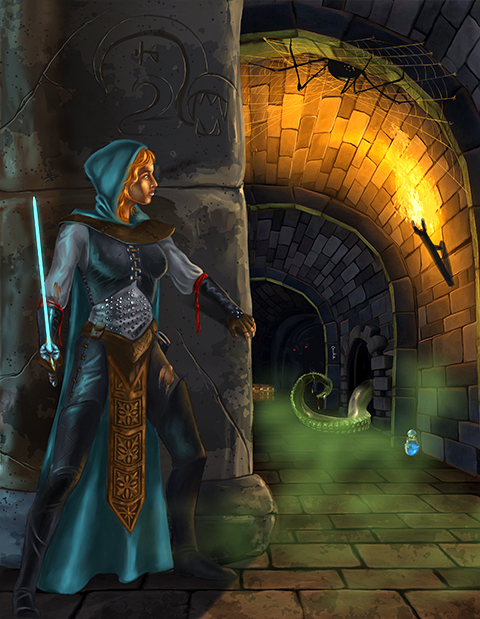 A never before seen blend of puzzle, maze and dungeon crawl! Launching on Kickstarter May 14! Guide Ren, the Elkassi spy, on an exciting, danger-filled journey to overcome evil and save the world. 25 campaigns across multiple story chapters! Each area is a fully illustrated, handcrafted puzzle. Mark your progress directly on glossy laminated pages with a fine-tipped dry-erase pen as you carefully navigate the ever-changing mazes. Get keys to open doors to new paths. Wield powerful weapons and armor. Discover magical artifacts, life-giving elixirs and treasure. Defeat dangerous enemies and avoid devious traps. Prepare yourself to conquer the deadly boss at the end of each level. Riddle your way through each puzzle. Find the correct solution to complete the area and advance the story. Can you survive the Twisty Little Passages?